A cross-party Congressional budget committee convened after an October government shutdown has reached an agreement to fund federal services. The proposed deal finances the government for two years and reduces the federal deficit by $23bn (£14bn). 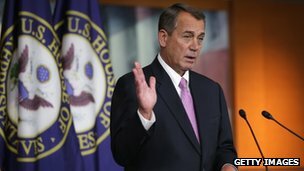 It also avoids another government shutdown on 15 January when government funding is scheduled to run out. The budget deal also offsets $63bn in previously enacted automatic military and domestic spending cuts triggered in January when Democrats and Republicans failed to reach a budget compromise. 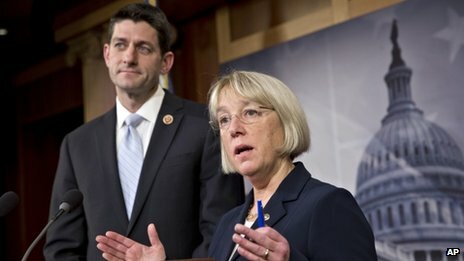 Mr Ryan and Democratic Senator Patty Murray, the respective chairs of the House and Senate budget committees, were called on to reach a cross-party budget deal in the wake of October’s partial government shutdown over federal spending. “We have broken through the partisanship and gridlock,” Ms Murray said of the new deal. Mr Ryan said he was optimistic the new budget agreement could pass both sides of the highly politically divided Congress. US President Barack Obama issued a written statement labelling the agreement “balanced” and “designed in a way that doesn’t hurt our economy”. But, “because it’s the first budget that leaders of both parties have agreed to in a few years, the American people should not have to endure the pain of another government shutdown for the next two years,” he added. Government officials say the deal, totalling an estimated $85bn over the next decade, aims to carve $20bn out of the nation’s $17 trillion debt. Democratic lawmakers have also expressed frustration over a failed bid to extend benefits for people unemployed longer than 26 weeks. That program will expire on 28 December, cutting off benefits to more than one million individuals. But many have praised the cross-party deal as a crucial step forward after political rancour led to a 16-day government shutdown in October which halted many federal services across the country. The manoeuvre is said to have cost the US economy $24bn, as projected by financial services company Standard & Poor’s. Under a temporary deal reached to end that political standoff, the newly-formed budget conference committee was given until 13 December to come up with a new deal or face triggering further automatic spending cuts. Those cuts, estimated at $20bn, would come largely from the Pentagon, according to media reports.